All of the speakers listed here are confirmed at this time. However, should anyone be unable to attend (for any reason), the committee will provide substitute speakers and/or topics. The views of each speaker are personal and do not necessarily reflect those of other speakers, or of the sponsoring organizations. 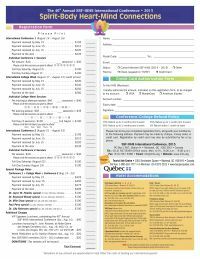 Here is a printable registration form in PDF format (132 KB) that you can complete and return to the SSF-IIIHS by mail or by fax. You can also register via our Online Store , or with PayPal via our conference Landing Page. Pre-register now for this extraordinary event! Private Benefit Readings with visiting SSF Intuitives, will be available at lunch and dinner periods, throughout the ten-day event. These readings are provided for spiritual education and recreation. Guest intuitives volunteer their services as a benefit activity for the SSF, a registered charity. Please make appointments in advance, at the conference desk. The SSF-IIIHS, co-sponsoring organizations, conference committee members, organizers, and hosts, have freely volunteered their time and given the best of their abilities to provide you with an unforgettable learning experience. We hope that you enjoy it!